Researchers at MIT and Paris Descartes University have developed a technique for precisely mapping connections of individual neurons for the first time by triggering them with holographic laser light. The technique is based on optogenetics (using light to stimulate or silence light-sensitive genetically modified protein molecules called “opsins” that are embedded in specific neurons). Current optogenetics techniques can’t isolate individual neurons (and their connections) because the light strikes a relatively large area — stimulating axons and dendrites of other neurons simultaneously (and these neurons may have different functions, even when nearby). The new technique stimulates only the soma (body) of the neuron, not its connections. 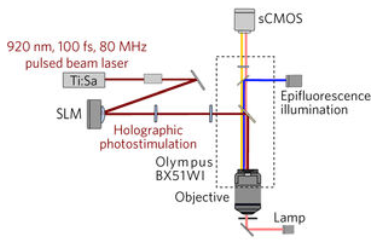 To achieve that, the researchers combined two new advances: an optimized holographic light-shaping microscope* and a localized, more powerful opsin protein called CoChR. In the new study, by combining this approach with new ““somatic channelrhodopsin” opsins that cluster in the cell body, the researchers showed they could stimulate individual neurons with not only precise spatial control but also great control over the timing of the stimulation. When they target a specific neuron, it responds consistently every time, with variability that is less than one millisecond, even when the cell is stimulated many times in a row. 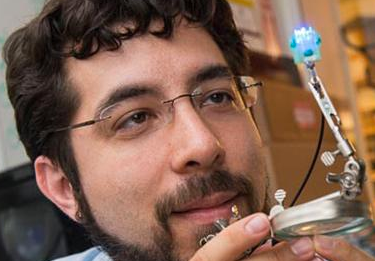 “For the first time ever, we can bring the precision of single-cell control toward the natural timescales of neural computation,” says Ed Boyden, an associate professor of brain and cognitive sciences and biological engineering at MIT, and a member of MIT’s Media Lab and McGovern Institute for Brain Research. Boyden is co-senior author with Valentina Emiliani, a research director at France’s National Center for Scientific Research (CNRS) and director of the Neurophotonics Laboratory at Paris Descartes University, of a study that appears in the Nov. 13 issue of Nature Neuroscience. Using this technique, the researchers were able to stimulate single neurons in brain slices and then measure the responses from cells that are connected to that cell. This may pave the way for more precise diagramming of the connections of the brain, and analyzing how those connections change in real time as the brain performs a task or learns a new skill. * Traditional holography is based on reproducing, with light, the shape of a specific object, in the absence of that original object. This is achieved by creating an “interferogram” that contains the information needed to reconstruct an object that was previously illuminated by a reference beam. In computer-generated holography, the interferogram is calculated by a computer without the need of any original object. 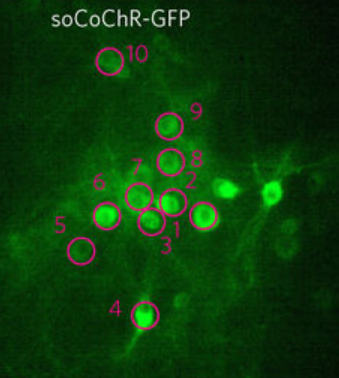 Combined with two-photon excitation, CGH can be used to refocus laser light to precisely illuminate a cell or a defined group of cells in the brain.